Wastewater from boreholes usually drains back into the water table unused. The water point committee in Mandeule village, TA Kaduya, Phalombe district, however, has recognised the benefits wastewater can offer, having constructed a vegetable garden to generate income to support the borehole’s maintenance. The water point committee was trained in Community Based Management (CBM) by United Purpose (UP), formally known as Concern Universal, under the PE CS WASH project. Part of the training included financial management and means of generating income to ensure the sustainability of the borehole: “During the CBM, we leaned about innovations such as Bank Pa mjingo (Village Saving Loans) and the development of gardens at the water points’’ narrated Ester Muhara, secretary of the water point committee. Using the waste water from the water point the committee the committee was able to grow and harvest vegetables last year, earning MK 9,000 to contribute to the borehole sustainability fund. The money was used to buy spare parts for the borehole. “On top of buying the borehole spare parts we were able to contribute to the health of the community since vegetables contains important nutrients”, narrated the chairman of the committee Mr Sambani. 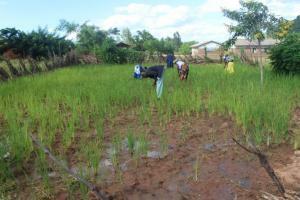 During the current rainy season, the committee has been growing rice in the garden using the waste water from the borehole and rains. The committee works together to take care of the crops in the garden. “We don’t leave the work of taking care of the garden to one person; we work as a committee’’ narrated the chair of the committee Mr Sambani. The committee plans to sell the rice at a price of MK 25,000 once it has been harvested, and the money will go to Bank Pa mjingo. “At first we never knew or considered how the waste water could be used to support the village or borehole. The CBM training has opened our eyes and we now know on how we can reuse waste water by constructing the gardens like the one we have now. I feel frustrated when I see waste water at a water point not been reused since reuse of waste water can contribute to the development of a community”, narrated Ester Muhara secretary of the committee.